If you've ever backed up a hard drive, or just wanted to move files between systems, you know the process almost always takes longer than you'd like. 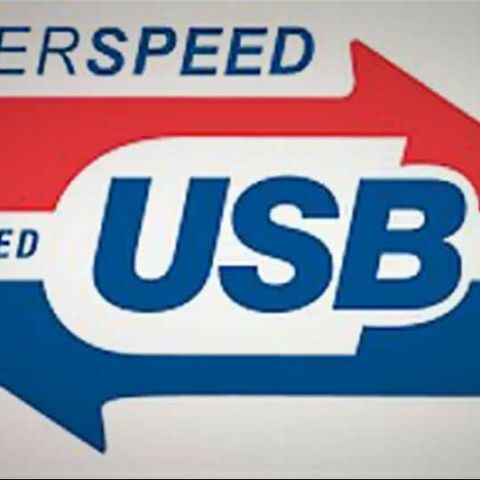 That's why I've been so enthusiastic about new technologies such as USB 3.0, which promises transfer rates as much as 10 times faster as USB 2.0. 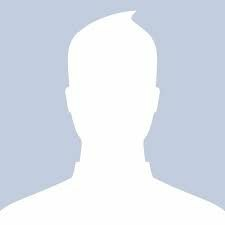 In practice, I haven't seen that drastic of a performance improvement but I have seen some very noticeable improvements, depending on the kind of data being backed up. As before, I started with Seagate's FreeAgent GoFlex drive, a 5,400-rpm 500GB drive that is available with multiple connections. I tested with both USB 2.0 and USB 3.0, and then tried again Seagate's 7,200-rpm BlackArmor PS100, a USB 3.0 drive. Next, I tried a USB 3.0 flash drive, in this case Kingston's DataTraveler HyperX 3.0, a 64GB flash drive that promises read speeds up to 225MB/s and write speeds up to 135 MB/s (both big jumps over what you can expect with traditional memory sticks). I wouldn't pay much attention to the minor differences among the various drives. Recall that hard drive performance can vary depending on where on the drive the actual file is written. The flash drive was slightly faster than the hard drives, though nowhere near the rated speed; all the drives are impacted somewhat by the time it takes to start the drive and by the overhead of the operating system. 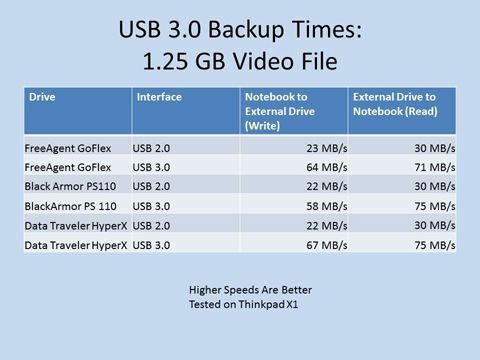 More importantly, the overall speed was two and a half times faster on USB 3.0 than on USB 2.0. As you can see, overall the speeds are much slower, in part because Windows—like any operating system—not only has to copy over the data, but has to write the location of the data to its file allocation table (NTFS for the hard drives; FAT32 for the USB drive). In both cases, I used the default. With more files, there are more individual writes and that makes a big difference. Don't pay too much attention to the minor differences among the various drives; as before, remember that hard drive performance can vary depending where on the drive the actual file is written and (especially on this test) by how fragmented the drives are. Here, the DataTraveler flash drive is notably faster than the external hard drives running USB 3.0 (although slower when attached to a USB 2.0 port). In general, I still see a noticeable improvement, but it ranges from a 33 percent improvement to just less than twice as fast. It's good but far from the tenfold difference in rated speeds among the interfaces. Still, a nearly twofold improvement can be a big deal. On my tests, writing the multiple file backup took 37 minutes to the flash drive on USB 2.0, but only 20 minutes on USB 3.0. For the single video file, it obviously took much less time (about 20 seconds versus one minute), but a bigger percentage change. Overall, then, I'd call USB 3.0 a success even if it's not quite as big a breakthrough as the vendors tout. 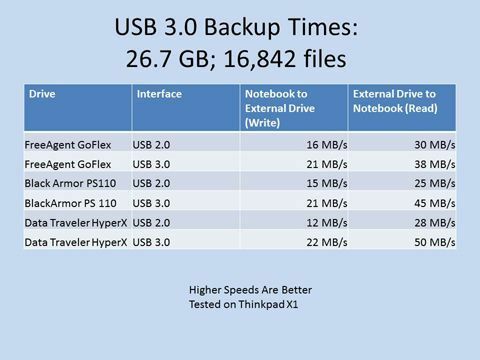 I can certainly see the benefits of carrying a USB 3.0 memory stick, such as the Kingston DataTraveler HyperX, for backup as opposed to a 2.0 one, particularly if you're going to be doing many backups.